After making my first tofu at home, there seemed to be an inordinate amount of biji (비지; soy pulp or okara), a by-product of making tofu. Although the traditional use of soy pulp is mostly limited to biji jjigae (비지 찌개; stew with soy pulp, pork and aged kimchi as main ingredients) in Korea, there are plenty of okara recipes on the web, ranging from “crab” cakes to cookies. After a few servings of biji jjigae, I started adding biji to rice, scallion pancakes (파전; pa jeon), muffins, and rice cakes. I keep biji frozen, which is already cooked once in the process of making tofu, shaped to a thin layer in a ziploc bag. When I need it, I break the amount I need and toast it in the oven just to dry out a bit, which becomes more manageable in baking and cooking with excess moisture taken out. These days, I need it quite often and now the extra biji I have is a fun ingredient, and not a headache anymore. 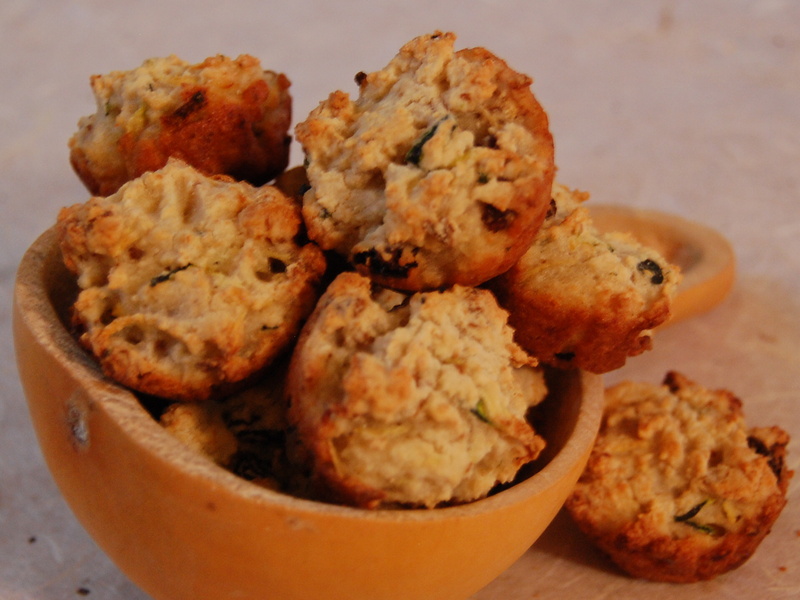 That’s also because of my new Zucchibi Minis, zucchini and biji rice cake baked in the mini muffin pan. Similar to other zucchini-based bread and cookies, zucchini will display itself only in the specks of green color, not in flavor. Biji, while neutral in taste, adds crispy texture along with much of its soy protein and fiber. When I finally came to this recipe, I felt like I hit a jackpot in the kitchen, with light crispy outside, gooey soft inside, and just sweet enough with subtle lemony, gingery flavors. All of these with no butter and little oil, only to coat the pan. So cute and so delicious! 1) Toast soy pulp (비지; biji) in the 300F or 150C oven for 15~30 minutes, stirring every 5 minutes or so for even toasting. As biji dries out, it will become crumbly and color will get slightly darker. Cool down to room temperature. Set aside. 2) Sift together sweet rice flour, baking powder, salt and ginger powder. 3) Mix well the egg, sugar, milk , and lemon zest. 4) Mix in the shredded zucchini to the wet mixture of #3. 5) Combine the flour mixture from #2 and the wet mixture from #4. The dough will be a similar consistency to a cookie dough. 6) Mix in the walnuts and raisins. 7) Grease a mini muffin pan well with vegetable oil. Spoon the mixture into the pan. 8) Bake in the 350F or 180C oven for 30 minutes. 9) Cool to room temperature on a rack. It is best to eat them at room temperature on the day you bake them, but you can also freeze any leftovers. Microwave them for 30 seconds, which will give you more of the traditional sticky rice cake texture. Or put them back in the 350F or 180C oven for 10-15 minutes, which will revive the crispy texture along with the soft-gooey warmth inside. If you don’t have a mini muffin pan, you can use a greased, parchment paper-lined sheet pan. Portion the dough into tablespoon-sized drops and place them on the pan. Don’t press the dough down. *You can replace low fat milk with soy milk (don’t use fat-free). **You can also replace zucchini with ae ho bak (애호박), a cousin of zucchini that’s more common in Korea. They are lighter green and slightly sweeter whereas zucchini are darker green with a hint of bitter flavor. For this recipe, either will work fine.